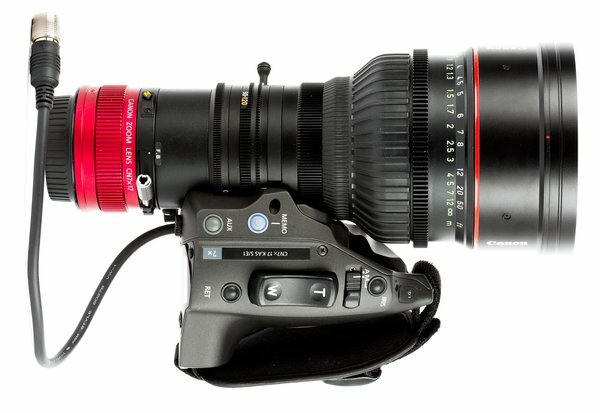 Canon's 17-120 T2.95 KAS Cine-Servo PL Mount CN7x17 rivals best-in-class zoom magnification and mid-range focal lengths for the Super 35mm format, and is engineered to offer superb 4K optical performance for demanding high-end productions, meeting and exceeding industry standards. Intended for the working professional, the 17-120 T2.95 KAS Cine-Servo PL Mount CN7x17 lens has markings on angled surfaces on and both sides of the barrel, making it easy to read settings from behind, or from either side of the camera. Focus markings can even be switched from standard labeling to metric, depending on production need. This lens is equipped with control rings designed to maintain the proper amount of resistance with consistent operating torque, and a covered flange-back adjustment mechanism to meet numerous of production application needs. Servo motors can control zoom, focus, and iris for ENG-style operation. The servos can zoom from 17mm-120mm anywhere from a half a second up to 300 seconds. The servo is control by the industry standard 12-pin cable interface for regular Canon broadcast lenses. Check out the instruction manual here.